A sustainer program can blossom into something big before you’re truly prepared, so it is essential to start good database habits early. It will be important to have key reports and metrics set up to run on a regular basis so that you can ensure that you’re retaining the maximum amount of revenue all across the year, and not losing critical donors to expired cards or memberships. Make sure the following reports are set to run at least on a monthly basis from your CRM/Database. If you don't know how to set these up, reach out to your help desk at your database service provider. The days of asking someone to write a check every month are long gone. Current best practice in sustainer programs is to offer two ways to collect monthly payments from your sustainers — credit/debit card and EFT (Electronic Funds Transfer). Credit and debit cards are the most basic and popular way to acquire sustainer gifts. Most people you solicit will have a credit or debit card close at hand and your system should already know how to recognize these gifts, making input simple and efficient. The challenge of a credit card payment is that credit cards can get lost, stolen, or cancelled, and eventually they all expire. This means that a key element of successful credit card payment management is to have an ongoing process, called a recapture program, for identifying cards that are coming due for expiration or have failed transactions for any reason, and a method for contacting the donors to obtain updated payment information. This may include monthly mailings, emails, or follow up phone calls. Whatever the method, having a clearly defined, regular, and efficient process in place will ensure that your station maintains a low rate of sustainer attrition and your station does not lose this reliable revenue. Details and samples can be found in the retention section. A sustainer program will increase the volume of the transactions your station processes on a monthly basis. It's worth your time to check with your financial institution or payment processor to find out the rate your station is currently paying per transaction in case it may have a meaningful impact on your budget. Far more reliable for ongoing payments are Electronic Funds Transfer programs (EFT). These payments come directly from a sustainer's bank account, which means you will need to secure the Transit Routing Number (TRN) and account number for their checking account. The significant benefit of offering and heavily promoting an EFT payment program is that you don't have to worry about credit card mishaps, massive third-party security breaches or expiration dates — and more of your supporters stay current with their payments for a much longer time because people rarely change bank accounts. Plus, stations realize a net gain with lower processing fees. On average, more first-time sustainers will join using their credit or debit cards because it's easier. Offering the opportunity to 'make the switch' to EFT later in their membership cycle provides the organization with an excellent point of contact to reaffirm the importance of sustained membership, remind them of the lower cost to the station of EFT payments, and ask for an increase in their monthly gift. The benefit of EFT over credit cards is clear in both higher retention rates and lifetime value. More information and resources can be found in the retention and upgrades sections. 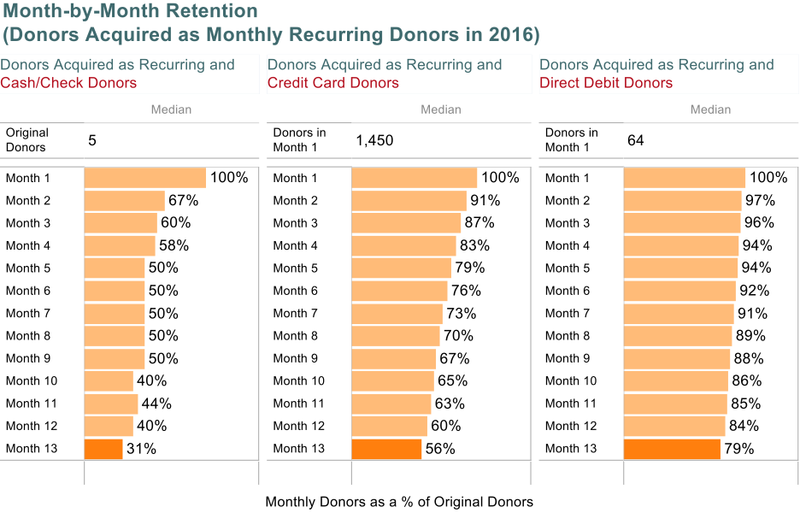 This chart, developed by Target Analytics using public television data, illustrates the power of not only adding more sustainers to the file, but of focusing on transitioning more credit card donors over to Electronic Funds Transfer. More information and resources can be found in the retention and upgrades sections. Now that we've discussed how you'll collect sustainer payments, you're probably asking yourself how to properly code these monthly donations in your system — and if you're not asking yourself that question, anyone entering data will be asking it of you. Just as in any other kind of campaign, it's vital to assign proper and consistent source codes to your donors' actions. Only through proper source coding can you project and report on expected sustainer revenue, determine how to segment donors to receive or be excluded from solicitations, analyze how your campaigns are performing overall and within segmented groups, and have access to actionable data based on the performance of those segments. There are a number of options for how you will want to segment your database, depending on your station’s needs and the parameters of your database. Set up a call early with your database provider to establish their general guidelines and stay in touch. As one example, general guidelines for one of the most popularly used systems in public media can be found here. As sustainers move thorough your program across time, it's essential to always retain the source code that notes the channel through which your sustainer first arrived, and based on that, whether they've since proven responsive to on-air, telemarketing, direct mail, or online appeals. Preserving an origin code of the donor's entry point into sustainer membership even after they have maintained their membership over many years is important as your sustainer program grows and matures. Knowing how donors are becoming sustainers will allow you to focus energy and resources in the areas that are producing results and modify efforts for those that are underperforming. For example, if a sustainer joins through an on-air drive, they should be assigned an on-air source code. At the time of their annual sustainer membership expiration roll-over, then their source code would change to a more general sustainer code, but the original code is maintained on their record for future analysis. Additionally, your source code structure should ensure that sustainers, whether new or multi-year, have unique segment codes within any given general solicitation. If sustainers and one-time givers will be mailed your end-of-year appeal, coding them separately ensures you have the information necessary to determine the mailing's effectiveness by group. Remember that each database has unique business rules, so ensure your plan for coding sustainers follows those rules and complements the rules in place for one-time gifts. Working with your database company is key to your system functioning well for your program. Of primary importance for sustainers is to understand how your database rolls over your sustainers' annual expiration date so that they continue to be charged every month until they ask to stop. 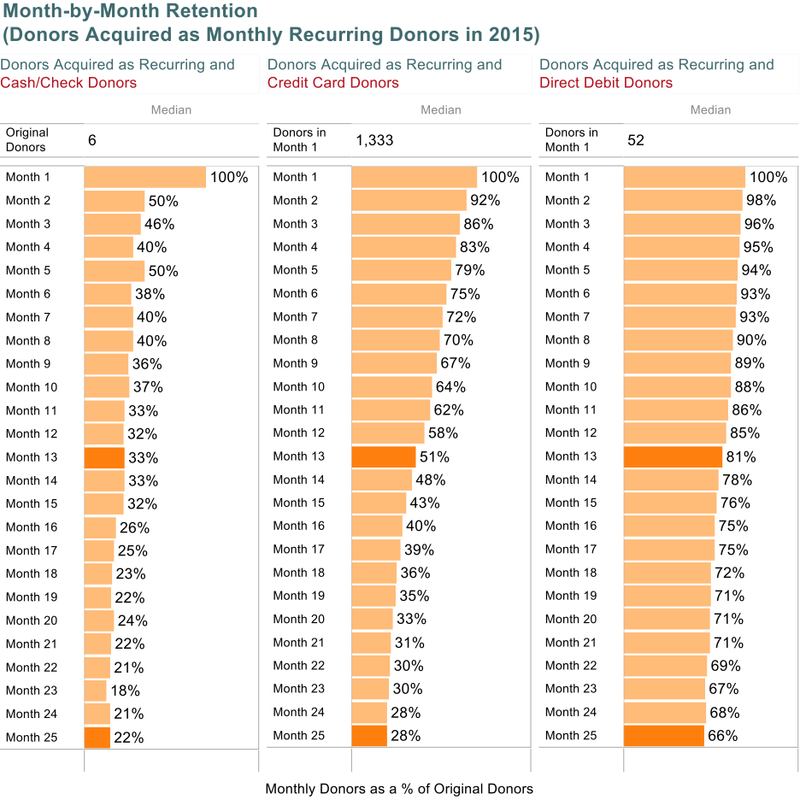 Some systems roll over donors on a monthly basis, some annually, and some give you the choice. Work with your database service provider to make sure you understand how this works and have all of the necessary protocols in place. Given the choice, programs that set a rollover date at a single, unified time each year tend to be less time consuming overall to staff, and have less opportunities for processes to run into problems or miss critical steps. A good sustainer source code structure needs to tell you how the sustainer was acquired or converted from another type of giving, when that happened, and — if absolutely nothing else — that this donor is an active, current sustainer. Even if your program is too small for in-depth segmentation, you'll want some sort of consistent indicator in all sustainer source codes so that you can treat these donors accordingly down the line. That goes beyond merely processing their monthly gifts and projecting resulting revenue. It means ensuring you can include or suppress them from select solicitations within your fundraising plan, as will be discussed in greater detail in the Retention section. And don't forget, before your sustainer campaign begins, you're going to need to be ready for the influx of new sustainers you're about to add to your system. Be sure to have the campaign mapped out in the database ahead of time. Have your process in place to capture updated donor information. Then you'll be prepared to enter the pledges as soon as they come in to start seeing that return on your investment!